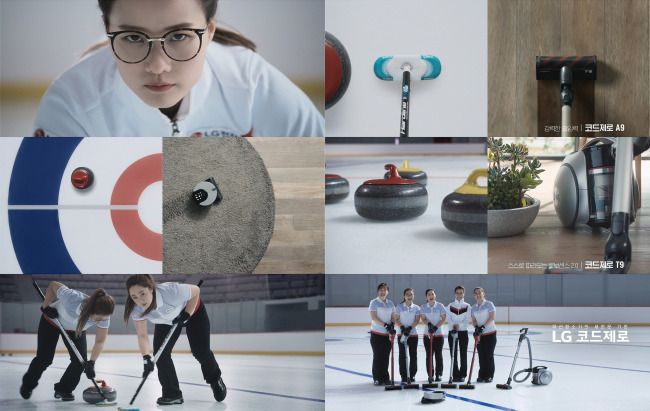 A highly anticipated vacuum TV ad featuring Korea’s women’s Olympic curling team began airing Saturday, according to LG Electronics on Sunday. The commercial uses the Winter Olympic sport as a motif to promote its Cord Zero A9, R9 and T9 vacuums. Starting with a cut of team skip Kim Eun-jung’s piercing stare, the team maneuvers LG Electronics’ vacuums to clean a house the way they maneuver brooms and stones on the ice. The Korean women’s curling team ultimately lost the gold to Sweden during the PyeongChang Olympic Games but rocketed to international fame as the “Garlic Girls” thanks to their shared hometown of major garlic producer Uiseong. Since the games, the team has spawned parodies online of fans vigorously sweeping in front of their TV sets. Many had called for the team to be featured in an ad for vacuums.